New Trend For Year Over Year Home Sales? 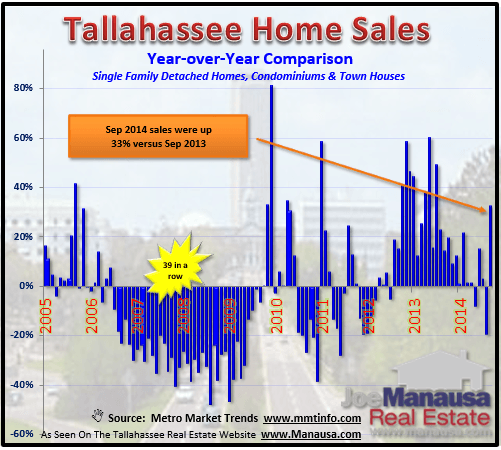 Year over year home sales in the Tallahassee MLS improved by 12.7% in December after showing a 1% decline in November. For those of you that missed the special report on year over year home sales, November was the first declining month posted in 16 months. Considering our real estate recovery still has far to go, we believe these measurements very important for tracking the trend of changes in the Tallahassee real estate market. A year over year home sales graph is used to visually identify the strength of recent sales compared to the same period last year. This month, we are looking at residential sales in the Tallahassee MLS in December 2013, and comparing them with the sales that occurred in December 2012. What we hope to see is more sales in 2013. December was a very good month for the Tallahassee real estate market (all MLS areas include the surrounding counties), and it means that year over year home sales rose in 16 out of the last 17 months. That is a very strong positive trend. In the graph above, the number of home sales are plotted in green (measured on the left vertical axis), while the percentage change each month when compared to its corresponding month the year prior is plotted in red (and recorded on the right vertical axis). Thus if the red line rise above the "0%" line, it demonstrates a gain, and those months that fall below the "0%" line show a decline. Barring any unexpected major increases in mortgage interest rates, I expect to see more gains than declines from this report throughout the year. Residential sales still have a considerable ways to go to reach the level that Tallahassee has sustained in the past, and all signals suggest further gains in the market recovery. If you would like to keep on top of the Tallahassee real estate market without having to do much work, simply subscribe to the Tallahassee real estate blog and you will receive a daily email that contains the latest news including a monthly look at year over year home sales.